A noted philosopher once said, “When you come to a fork in the road, take it”. The directionless nature of that advice should tell you the philosopher was Yogi Berra whose career as a catcher for the New York Yankees which would eventually land him in Baseball’s Hall Of Fame was just getting started itself around the same time as rock ‘n’ roll was in 1947. Berra’s extensive career on the diamond, as both player and later as a manager, would be overshadowed in time by a lifetime of malaprops and confusing observances of life that came to be universally known as “Berraisms” and the one which leads off this review is one of about two dozen that can be recalled word for word from memory decades later thanks to the sheer number of times it’s been recounted over the years. But rather than trying to get a weak chuckle out of readers for using it here there IS a point being made by applying it for the B-side to Dave Bartholomew’s commercial and creative breakthrough found on the just reviewed A-side which appeared here yesterday to glowing praise. 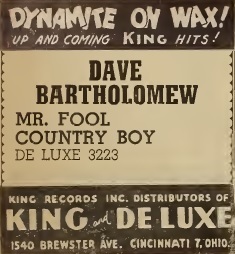 The reason is Bartholomew had come to the fork in the road of his recording career in early April 1949 after one previous session in late 1947 resulted in two releases that were as stillborn artistically as they were when it came to garnering any sales. After a year and a half spent re-evaluating his musical direction while leading a band in New Orleans whose reputation soon towered over any other in the region he got another chance to cut records and laid down four sides that day when re-entering the studio in hopes of advancing his career. Two of the songs were headed down the right road, the one that would soon result in acclaim and hits. One was a retro jazzy number to flex those creative muscles lest they atrophy altogether now that rock was his primary outlet. Then there’s this one… the one which headed in the other direction at that proverbial fork in the road in the hopes that whatever was waiting down there might be worth pursuing. But that’s not to say you’d know that without venturing down the road a ways to see what lay around the first bend or two. We spent a lot of time early on in this journey of rock history, back in the waning days of 1947 and early 1948, reminding people that there was no roadmap to follow, no familiar landmarks to look out for to tell you that you were on the right path, no visitor centers to stop and ask for directions, certainly no satellites to pinpoint your location on your phone and steer you to someplace more hospitable. All you had were your instincts, your accrued musical knowledge and a lifetime of evidence as to what sold… which you then had to out and out ignore if you wanted to chart an entirely new course in rock ‘n’ roll. But that in of itself was a scary thought when earning a living by playing music was your lifelong dream and now that you were getting just such a chance you were risking it all to pursue a hazy vision of something that might not actually exist, or if you helped to create it might not be a sound that anybody in the listening audience would want to hear. The farther you walked along that desolate road the less chance you had to ever make it back to civilization and a viable career should you eventually give up and turn around. Every so often though you’d see signs of it paying off when a particular song connected in a live venue or better still, when it sold enough to encourage you to keep going. By 1949 that road had widened and thriving communities were going up along the way, increasingly able to sustain and support this music which now was in the process of buying up more and more land to build ever larger cities. In retrospect it would seem as though there’d be no decision to make if you came to that fork in the road by this point in time. The way seemed clear, the golden city was beckoning and all you had to do was keep going, heading towards where the lights shone brightest. But until YOU’VE seen it with your own eyes, until you’ve been welcomed into that town and lived it up in the lap of luxury it still was a daunting walk to make. So Dave Bartholomew took a few steps down the other road… still headed in the same general direction maybe, at least according to the compass, but one that retained just a few more familiar sights from the old school approaches you were used to which gave you some false assurance that this might be the road to take after all. The full horn fuselage is back, which means Bartholomew’s trumpet sits alongside the two saxophones in the group intro that harkens back to the sound that was rapidly losing favor in rock, and for good reason. Now it’s not glaringly out of place like we’ve heard so many other times when the trumpet horns in (to use a truly awful pun), but it certainly doesn’t sound anywhere near as modern as the flip side did which had jettisoned the trumpet altogether during its intro. But the trumpet’s inclusion right off the bat all but kills the commercial prospects of Mr. Fool in the rock market as well as signaling a stylistic uncertainty that we thought he’d vanquished altogether. The fact that it’s played as a siren call, its bold, brash sound trying to startle before pulling you in, reveals that the positive decisions that had marked each of the last two A-sides were tempered by the negative choices that adorned both B-sides. That they all were cut at the same session however lets Bartholomew off the hook somewhat. Though there certainly was plenty of evidence as to what approach best worked in rock prior to him stepping back in the studio this past April, he might have just needed to see for himself to be absolutely sure and by splitting his material into some that were forward thinking and others which were backwards looking he was hedging his bets, so we’ll grant him that consideration provided he let the results speak for themselves once they were released. Once he received verifiable proof of which direction worked via their chart placements he would reward our good faith in him by pursuing that avenue consistently over the next decade. So this serves as a rare look into the decision making process at a time when those results are still yet to be known, when he tried both roads to see which led to where he wanted to go. Mr. Fool isn’t that place, but by heading down the same path we can try and get some insight into what he thought might work and ultimately why it didn’t. So while we’re confronted with those horns we’ll hold back a bit on offering up an outright dismissal of the record, giving Bartholomew a generous benefit of the doubt, hoping that he’ll somehow figure a way to make it work all the same. But what follows catches us a bit off guard. We’ve just heard his creative leap forward on Country Boy which adorned the top side of this release, but now it seems we’re hearing the working version of the same composition. The prancing melody is eerily similar, though this is played a touch slower and is lacking the more pronounced rhythm section to give it a more defined bottom here. Those changes, though minor, are notable because it makes Mr. Fool sound more like something meant to be observed from a distance rather than let the audience feel like they’re a part of it, which come to think of it serves as a pretty fair approximation of the difference between rock, the ultimate in communal music, and other styles of music which often add a layer of distance between performers and listeners. But that’s not the only aspect of this which shares its DNA with the better side, as the lyrics could almost serve as a backstory for Country Boy. In that song Bartholomew was being dismissed due to his rural background before revealing what a mistake that was as he proceeded to score with the girls who admired the attributes he DID possess in abundance. On this we’re hearing those earlier barbs firsthand with him detailing them one by one as they happen, in essence setting up and predicting what will happen on Country Boy. This part is even more boastful than what we get on that side, maybe because he hasn’t yet achieved that victory and so he’s compensating by flaunting his confidence to cover up his underlying uncertainty. The words are effective enough, it’s just that we aren’t as invested since we know the eventual outcome, not to mention the basic arrangement isn’t as captivating with the shift in emphasis away from the stronger rhythm we appreciated so much last time out. 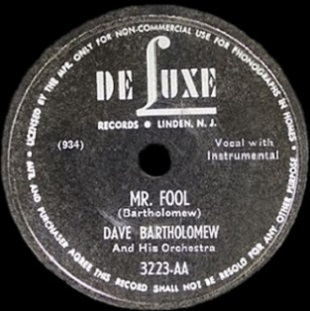 But where he really loses us is in the instrumental department when Bartholomew’s trumpet sits front and center in the solo which, unlike the other side where he cut the fat from the meat, here it’s nothing BUT fat and it makes for a tough meal to chew as he incorporates all of the horn’s most distasteful elements – the long droning lines, the grating tone, the lack of any warmth or resonance, or for that matter any energy and excitement – leaving us looking for a good reason to be excused from the table until the next course is served. It starts off alright, as trumpet solos go that is, but the longer it goes on (and it goes on a LONNNNNNNNNNNNG time) the more lost Mr. Fool becomes. During this unfortunate interlude the backing instruments contribute nothing worth our time and trouble to make up for having to sit through something so indulgent. It’s not long before Bartholomew wears out his welcome as well as our patience even though in another musical context it might be better appreciated. But not here. In fact the only aspect of the arrangement which is a pleasure to hear is barely audible as there’s a totally unexpected moment in the fade when Earl Palmer gives us a delayed echoed beat on drums which I suppose is sort of compensation for sticking through the rest of it, though few probably lasted until the very end unless they had to write a detailed review on the record. For all of its obvious faults though I can’t rip on Dave too much here due solely to the timing of it all. Had he done this same track on the NEXT session, after the far better A-side had broken through and showed him the way, then I’d be much less hospitable. Here though, as distasteful as the end result is, in a way I admire his exhausting every last possibility in the studio, seeking which combination of effects will produce the best results. Mr. Fool obviously isn’t it, not by a long shot, for while it sticks close to the general framework of the one that DID work, both lyrically and melodically, it’s the changes he made on Country Boy which paid off and set him on the right course. It also gives us a chance to pat ourselves on the back for suggesting those changes numerous times throughout this project before we got to this point – dropping trumpets for tenor saxes, employing a more pronounced bottom and stronger back beat while upping the tempo to create excitement if you weren’t going to lock into a deeper groove. Of course we had one advantage that Dave Bartholomew didn’t have in April 1949, namely that we had access to his later work where he DID incorporate all of those changes, which come to think of it is probably where we got the idea for those changes to begin with. To bring this back to Yogi Berra quotes, “You can observe a lot just by watching”… or by listening… and that’s the benefit of reviewing rock’s earliest stages from this vantage point – we already know what works. But since Bartholomew didn’t have a time machine at the ready he had to be the one to figure these things out for himself and it didn’t take him long to do so once these sides were in the can. The version that deserved to win out would in fact come out on top while Mr. Fool remained one of the failed experiments necessary to get us to that point. In that regard it served its purpose well enough, but for OUR purposes in determining which songs deserve to be remembered and praised, it obviously won’t be this one. Leave a reply on "Dave Bartholomew: “Mr. Fool”"